An article in Al Arabiya informs us that foreign archaeologists have discovered a new Assyrian site near the Arbil (Erbil) city center. Arbil is located southeast of the modern Kurdish city of Mosul, the area of Assyrian cities such as Nineveh, Calah, and Khorsabad. Archeologists working in northern Iraq have discovered a new Assyrian site in the vicinity of the historic Arbil city center, the head of the antiquities office in the Kurdish Province of Arbil, Haydar Hassan, was quoted as saying in an Iraqi newspaper. The Assyrian civilization flourished in northern Iraq between 1000-700 B.C., archeologists were led to discover the site when they exhumed a burial ground, complete with mud brick grave heads. To further unearth this site the foreign archeological team had to study and remove two more layers of civilization under which the Assyrian structure was buried, according to a report published by Iraq’s al-Zaman on Monday. The excavations have shown that the Assyrian graves were covered by remains belonging to the Sassanid Persian Dynasty that ruled Iraq before being dislodged by Muslim Arab tribes from the Arabian desert in the 7th century A.D., said Haydar Hassan. So far only the brick arches and corridors of the Assyrian layer have been brought to the surface. Although archaeological teams from Italy, the U.S., Germany, Holland, Poland and Greece are currently working in northern Iraq, Hassan did not say which foreign archaeologists were working on the newly discovered Assyrian site in Arbil. Assyria was a threat to Israel from 853 B.C., when they defeated Ahab at the battle of Qarqar, until the LORD defeated them at Jerusalem in 701 B.C., and the final defeat at the battle of Carchemish in 605 B.C. The prophet Isaiah warned the people of God about the Assyrian threat. 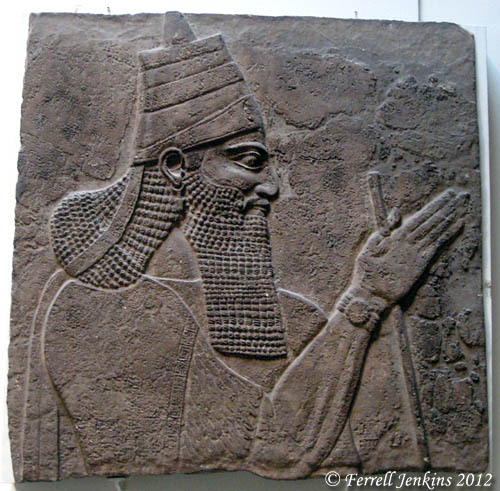 The photo below is of the Assyrian king Tiglath-Pileser III (745-727 B.C.). It was discovered in the central palace at Nimrud, and is now displayed in the British Museum.Tiglath-Pileser III is mentioned in 2 Kings 16:7, 15:29, and a few other references. Who knows what new things may come from other cities yet to be excavated? Tiglath-Pileser III, king of Assyria, from Nimrud. Now displayed in the British Museum. Photo by Ferrell Jenkins. This entry was posted in Archaeology, Bible Places, Old Testament and tagged Assyrians, Iraq. Bookmark the permalink. The relief of Tiglath-Pileser is one of my favorite items at the British Museum. It looks like he is wearing a wrist watch.